Last month, both the Chemical Safety Board (CSB) and OSHA used the ten-year anniversary of the BP refinery explosion in Texas City, TX to call for increased regulatory power and updated safety standards. Fifteen people were killed and 170 injured in the explosion that occurred when hydrocarbon vapors came into contact with an ignition source (still unknown, but suspected to be an automobile exhaust pipe). A subsequent investigation of the accident found organizational and safety deficiencies at all levels. The CSB characterized these deficiencies as a lingering problem throughout the industry, and pointed out their presence in major accidents since Texas City — such as the 2012 Chevron refinery fire and the 2010 Tesoro refinery explosion. OSHA noted that it leveled $21 million in citations to BP after Texas City — at the time, the most in its history — and that BP incurred a subsequent $87 million fine for violating the settlement agreement. In their commemorations, both OSHA and the CSB made clear that they feel the government could be doing more to prevent similar disasters from occurring in the future. 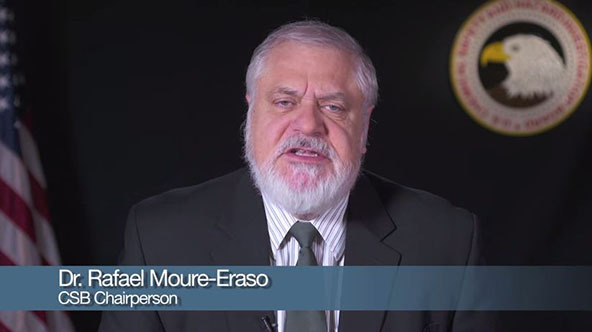 CSB chair Moure-Eraso said: “The CSB believes that current federal and state regulations do not focus enough to preventive measures intended to reduce process risks.” He went on to recommend the CSB be given more robust regulatory oversight and increased power. In its statement, OSHA claimed that its ability to level large, deterrent penalties is problematically limited by constraints in the OSH Act dating from 1970. It further noted that its Process Safety Management Standard has not been updated in more than 20 years, and that after the West Fertilizer disaster of 2013 it took an official action from President Obama to implement more stringent requirements and practices in the form of Executive Order 13650. For more information on the Texas City refinery explosion, you can read the final CSB Investigation Report here, and see OSHA’s list of site violations and subsequent settlement agreements here.